A desperate drug addict who carried out two knifepoint raids on a hair salon and a convenience store on the same day has been jailed for seven years. Joshua Lovell, who was locked up for the knifepoint robbery of a taxi driver back in 2011, was today (Thursday) jailed again for the attacks in Wyke and Dewsbury which took place on July 7. 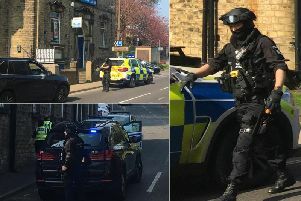 Prosecutor Heather Gilmore told a judge at Bradford Crown Court that Lovell’s first victim Amanda Ludbrook was working alone at the Angel Hair and Beauty Salon in Towngate, Wyke, when he came into the empty premises and pulled a knife with 10-inch blade out of his tracksuit bottoms. During the mid-morning robbery 24-year-old Lovell, of St Mary’s Avenue, Wyke, demanded cash from his victim and she was forced to hand over about £600 in takings. Miss Gilmore described how Lovell also snatched a set of keys from the complainant and she suffered a fractured finger which would have to be repaired by the insertion of a metal wire. About seven hours later Lovell targeted a convenience store on Old Bank Road in Dewsbury and confronted shopkeeper Manpreet Kaur as she worked behind the counter accompanied by her four-year-old daughter. Again Lovell brandished a large knife and demanded cash as Mrs Kaur manoeuvred her daughter behind her to protect her. The court heard that the shopkeeper kicked a box towards Lovell which caused him to stumble and he fled the shop empty-handed. Lovell pleaded guilty last month to charges of robbery, attempted robbery and possessing a bladed article and today Judge Jonathan Durham Hall QC said Lovell had been desperate for money to buy drugs or pay off drug debts. In total Lovell was given a seven-year prison term for the robberies, but the judge said he would subject to an extended licence period of three years because he had been assessed as a dangerous offender.